From the Saint Mary's University Maroon and White, Winter, 1994-95. This is a fictional article related to the mystery of the Star of Bethlehem. The scene is the astronomy library at Sippar, a city in Mesopotamia on the Euphrates River 50 km southwest of modern Baghdad and 60 km north of ancient Babylon. It is the evening of a day near the end of Kishlimu in year 306 of the Seleucid Era (mid-December of 7 BC by modern reckoning). Astronomers have gathered to assess the significance of their planetary observations over the last 7 months and to consult ancient records of planet positions stored on clay tablets. It has been a most curious period. The great planet Jupiter, named in honour of the king of the gods, has passed the fainter planet Saturn three times this year: at the beginning of Simanu (May 29), the beginning of Tashritu (September 30), and most recently in the middle of Kishlimu (December 5). Saturn, considered to be the Protector of the Children of Israel, is honoured by them with the day marking their Sabbath -- Saturday. An event of momentous importance to the Jews must be in the offing for the gods Jupiter and Saturn to be in close proximity to one another for so long. There is something more, however. A check of the records on the clay tablets reveals that such triple conjunctions of Jupiter and Saturn are fairly rare. The constellation of Taurus was the site of one in year 185 of the Nabonasser Era (563/562 BC), Virgo was the site of another in year 225 of the Nabonasser Era (523/522 BC), and the most recent such event occurred in Cancer in year 167 of the Seleucid Era (146/145 BC). One of their colleagues has been busy for the last three months projecting planetary movements into the future using a geometrical representation of their motions in order to predict triple conjunctions of these two important planets over the next few millennia. According to his calculations, fifteen more are predicted over the next three thousand years. But none will occur in Pisces, the site of this year's Triple Conjunction. The last result strikes them as being very important astrologically. Their recent observations of stars visible on the eastern horizon at sunrise indicate that a new astrological era has begun. What was once the Age of Aries, marked by sunrises in the constellation of Aries on the first day of Spring, has become, as a consequence of the slow march of precession, the Piscean Age marked by sunrises in Pisces on the first day of Spring. The meaning of the planetary conjunctions is now clear! The recent "rebirth" of the heavens in Pisces is preceding an Earthly rebirth of particular importance to the Jews. In accordance with Jewish tradition, the birth of the new Jewish messiah is being signaled in the stars. The Triple Conjunction in Pisces that they have witnessed, being the first and only such conjunction in Pisces during the entire Piscean Age, is the long-awaited signal! Evening twilight has just ended for the citizens of Jerusalem. Out on the Mount of Olives east of the Vale of Kidron on the edge of the city, a group of Magi (the local term for astronomers) has completed a short journey from Jericho, where they had an audience with King Herod at his winter palace. 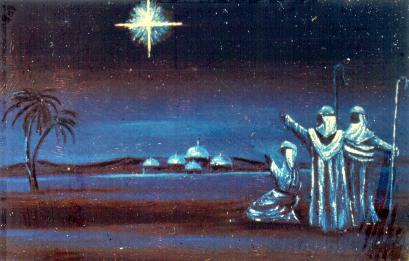 It is now the end of Shabatu (February 15, 6 BC), and the Magi have been directed by the Jewish scholars to the small town of Bethlehem, just south of Jerusalem. Their arrival in Jericho and the news of their two-month journey from the Kingdom of Parthia in search of the newborn messiah had created considerable consternation among the Jewish citizens. Could the reign of the despised King Herod finally be near an end? Certainly, Herod himself was most anxious to interview them to learn when the "star" had appeared. He had shown great interest in all that they had to tell him.